An HST optical image of Eta Carina, showing two large bubbles of gas expanding in opposite directions from the bright central region. Even as astronomers probe the farthest edges of the Universe billions of light years away to unlock its wondrous mysteries, there are still baffling mysteries right here in our own Milky Way Galaxy. A big, beautiful star named Eta Carinae is one such example. At the American Astronomical Society meeting in January, scientists presented new data about this enigmatic star that challenges long-held beliefs. Among the most fundamental mysteries is the life cycle of really big stars, those that are over ten times more massive than our Sun. This includes how such stars are created, how they live their lives (with important consequences for how matter and energy are distributed throughout the galaxies), and how they die in spectacular supernova explosions. Such explosions, equal in power to that of an entire galaxy, forge the elements that make up Earth and everything on it, including us. Eta Carinae is perhaps the most famous of the really big stars. It first gained widespread attention about 160 years ago when it flared spectacularly from obscurity to become one of the brightest in the sky. Found in the Southern Hemisphere skies in the constellation Carina about 7,500 light years from Earth, Eta Carinae is one of the most massive and intrinsically brightest stars known in the Milky Way Galaxy. It has a mass of at least 100 Suns, a figure that challenges theories concerning the upper limit of stellar mass. As a result of continuous monitoring of its X-ray emissions since 1996, as well as spottier observations back to the earlier 1990s, some astronomers think "Eta-Car" may in fact be two stars. These observations have revealed a distinct five-and-a-half year cycle in Eta-Car's X-ray emissions. 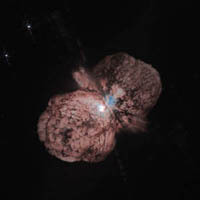 "If Eta Carinae is in fact two stars, the X-ray output should vary with the orbital period of a smaller star revolving around a larger star in each cycle, and this is in fact what we see," said Michael F. Corcoran, a researcher with USRA working at NASA's Goddard Space Flight Center, at the AAS January meeting. 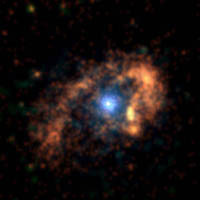 A Chandra X-ray image of Eta Car showing a horseshoe-shaped ring surrounding the hot inner region. Corcoran and his team have been carefully tracking the X-ray emissions from Eta-Car using the data gathered continuously by the Rossi X-ray Timing Explorer satellite since 1996, as well as earlier with the Roentgen Satellite (ROSAT). They now have seen Eta-Car repeating its cycle, bolstering their initial interpretation. As explained by Corcoran, the two-star theory proposes that a smaller or "companion" star with a mass of about 30 Suns swings around on a highly elliptical orbit every 5.52 years around a central or "primary" star. The primary star has a mass of at least 100 Suns. As the companion star swoops in, the streams of charged particles blown off from each star begin colliding, producing highly energetic radiation in the form of X-rays. The X-ray emission intensity rises as the two stars get closer because the clouds of charged particles flowing out from each star gets denser. The emissions abruptly drops to zero as the companion star swings -- from our perspective on Earth -- behind the primary star in such a way that its stellar winds are pointing away from us. The emissions begin again as the stellar winds of the companion star begin facing us again. Surprisingly, though, Corcoran and his colleagues have also found that Eta Carinae is emitting more X rays during this particular cycle than last time, even as it emits less of other types of electromagnetic radiation. "This may be due to differing amounts of stellar material being blown off of each star during the 5.52-year cycle," Corcoran said. Not everyone agrees with the two-star idea. Scientists cite the complicated visible and ultraviolet emissions from Eta-Car, which are not explained as well with a two-star model as with the "single star" model periodically belching out big emissions of gas. Such emissions could result from the combined effects of rotation, gravity, and pressure in an unusually large star. With the next X-ray peak expected in early summer, a large observation campaign is planned that will use an array of ground-based and satellite instruments, including the Hubble Space Telescope and the Chandra X-ray Observatory. The multiwavelength data it provides could answer fundamental questions about what the upper mass limit on giant stars is. These answers, in turn, will help astronomers determine the life cycle of stars like Eta-Car that, during their lives, shape the Galaxy and, through their deaths, seed the galaxy with the elements materials from which ourselves and our world come.